In a time when golf laser rangefinders are scrambling to compete with the miniature size of golf GPS units, compact rangefinders level the playing field. The Nikon Coolshot 20 is one such pioneering device, given its modest dimensions. We were apprehensive that its small size might be restrictive of its abilities. Instead, it turned out to be a well-executed rangefinders with all the required features. We delved deeper into the specs of the affordable Coolshot 20. 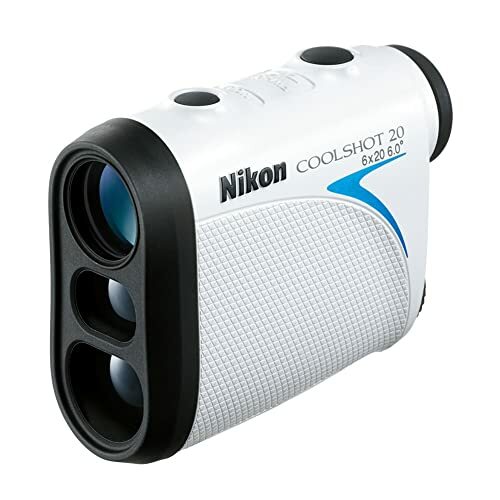 The Nikon Coolshot 20 is amongst one of the highly efficient laser rangefinders in the market. Evolving from the original Coolshot, this uses the traditional technology of shooting a laser ray at the target for calculating the distance to it. While the popularity of golf GPS has soared, laser rangefinders have a distinct advantage. They can be used on any course without any dependency on GPS and coursemap database. The petite package is another reason why Coolshot 20 gives the golf GPS a run for their money. It can fit easily into your pocket just like the GPS units. The Nikon Coolshot 20 laser rangefinder has a few special features that combine with its simple operation to give us a genuinely usable product. Rather than individual features, it’s the complete package that makes it worth more than its asking price. The design factor that’s immediately noticeable is how small the Nikon Coolshot 20 is. It measures only 3.6” x 2.9” x 1.5”. On the other hand, the original Coolshot was 4.37” x 3.03” x 1.57”. It weighed 6.34 ounces whereas, the Coolshot 20 weighs only 4.4 ounces. It will be hard to find a smaller laser rangefinder with the same features and capability. The debate is open on whether it’s easier to handle Nikon Coolshot 20 laser rangefinder or harder because of its condensed size. On the one hand, the lightweight comfort makes it easier to hold it level for a longer duration with just one hand. One the other, golfers who are used to holding laser rangefinders with both hands, might be flummoxed by this ultra-light design. Bushnell Pro X7 is the best laser rangefinder built for tactile advantage tough its heavy and needs to be held with both hands. 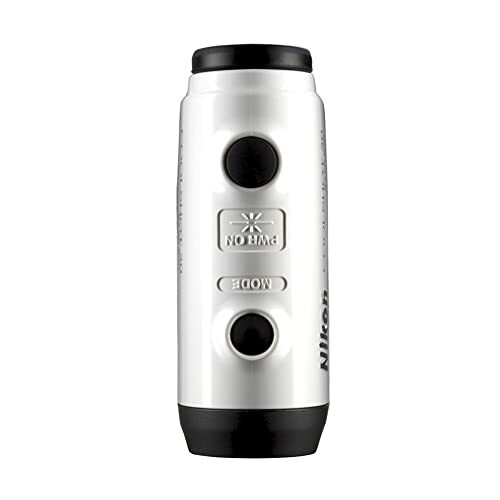 The Nikon Coolshot 20 has a white body with the eyepiece, reticules and controls done in black. The bottom half of the body has a pattern that gives you extra grip on it. You can comfortably hold it up to your eyes even if you wear glasses. Or else you can focus the lens based on your long or shortsightedness. The case can take minor falls and abrasions without damaging the laser inside. This Nikon laser rangefinder has only two controls. One is a power button and other is for mode. The power button needs to be tapped only once and it pans the course. It does not need to be held pressed. The mode button lets you change measurement unit between yards and meters. The Coolshot 20 laser rangefinder is water-resistant. It can’t be dunked into water, but it can be held in light rain until you find cover. This mode helps the Nikon Coolshot 20 laser rangefinder pick out the nearest targeted object against a cluttered background. This comes in extremely handy when you try to pick out a flag stationed in front of trees or bushes. Some of the more advanced laser rangefinders offer more target modes, especially if the flag is behind obstructive items. The Coolshot 20 laser rangefinder scans the horizon continuously once you tap the power button. In this mode, it measures distance to every object it can focus on. This goes on continuously for 8 seconds and finds distances to trees, flags, mounds etc. Some of the advanced laser rangefinders ditch this particular feature but it comes in handy when you are trying to formulate a golf strategy. Once the power button is tapped, the Nikon Coolshot 20 comes on for 8 seconds in Continuous panning mode. In this period you can get the target in the crosshairs and find the distance. This functionality helps save the battery life.Magnification: The laser of Coolshot 20 has a less powerful laser than the original Coolshot. But it still provides 6x magnification. You have a focus ring to focus the view until its clear and you have a proper view of the target. The Nikon Coolshot 20 shows yardages in the increments of 1 yard. Within the first 200 yards, the distances are accurate within 1 yard. After that the distances are read with maximum 2 yards uncertainty. 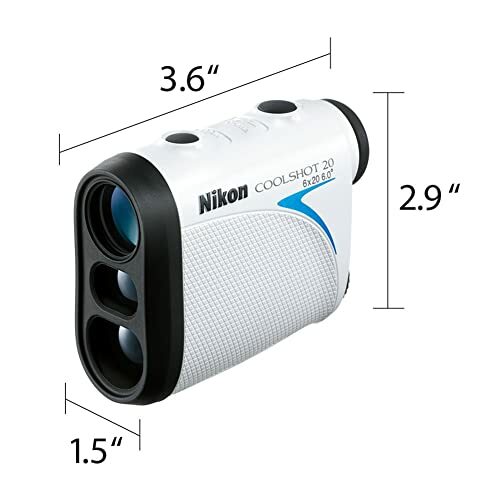 The Nikon Coolshot 20 laser rangefinder claims to be accurate until 550 yards. Most people find reasonably good response until 200 yards. Beyond that, you might have to fiddle a little to find the flag and get the distances as accurately as within 200 yards. The Nikon Coolshot 20 has a CR2 lithium battery lodged in a small compartment. It lasts through several months especially with its power-saving operation. The Nikon Coolshot 20 laser rangefinder is handy device which fits in the palms of golfers with big hands. While it’s convenient for some, the light weight throws some people off track. They may need to hold it with both hands to get it steady until they get used to the small item. But that’s a rare case. The speed of locking on the targets is average. Without Pinseeker, it takes a small interval to lock on the flag. Nikon Coolshot 40 can lock on the target instantaneously. While it needs to see more refinement to make to the b﻿est golf rangefinder lis﻿t. 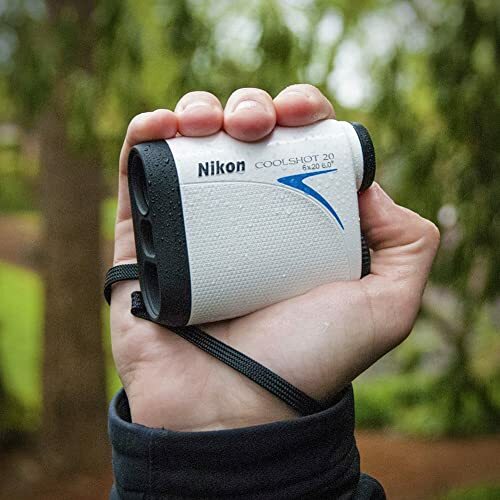 The Nikon Coolshot 20 laser rangefinder has been warmly regarded by its owners. There’s a consensus that this is a unit that you can trust on the course. Golfers who haven’t yet been spoilt by large and unwieldy rangefinders have a great time focusing this. All of them agree that it’s an extremely accurate device if you focus it correctly. In fact, the Nikon Coolshot 20 compared favorably to the higher-end Bushnell models in this regard. It is a dependable buy for the budget in which you have multiple inexpensive laser rangefinders in the market currently. Working with a small budget, Nikon Coolshot 20 laser rangefinder is a good choice. It’s super-light and compact to a scale that it’s the smallest in the market today. It has a well-planned set of features which are relevant to all types of golfers. It is accurate to the level of the more advanced laser rangefinders. The rainproof and robust case only makes it easier to stow it on the jacket pocket between rounds. If you require better features, you can look for the higher models in the same lineup.